In early days the village community celebrated Ali-Aye-Leegang festival for over a period of almost five weeks beginning Falgun month, conveniently at different dates. In those times, the main function of Leekgod was religiously solemnized conveniently on a fixed day within the month, but they observed the entire period as festival season in celebratory mood, occasionally organizing gleeful programmes. Keeping this early tradition of the community in mind, the Mishing Society of Mumbai celebrated Ali-Aye-Leegang much belated in the city this year, differing its official date of the actual observance. The members of Mishing community living in Mumbai and its suburbs gathered together in a posh resort named Zoia Resort, in Thakurwadi on the Old Mumbai-Pune Road to celebrate their most favorite festival of “Ali-Aye-Leegang” for two days on 7th and 8th March 2009. 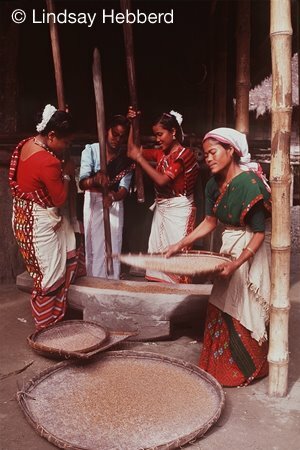 The resort allowed them enough space to accommodate the kind of celebration the Mishing people normally require for this function, which needs a wider area for performing the leeggod ritual over a ploughed and harrowed soil, also a broad even ground for free-style group dance synchronized by thunderous drum beats. At the early hour of the day on 8th March, a small piece of land was accordingly prepared, at one side of the spacious campus of the resort, decorated with pihro leafs in its four corners. The soil was cleared and suitably tilled with the help of spade and mattock to administer the leekgod ceremony, where a handful of rice-grains were broadcasted by Peter Pegu, eldest member and chairman of the Society, with invocation of ahbangs and chanting leegang hymns. Ghanshyam Pegu and Bijay Pait on the drums, Debajyoti Doley on cymbal had harmoniously modulated the sounds of drums to leegang beats and the all ladies and gents present on the gathering had joyfully broken into gumrag dance. The overwhelming crowd was later feasted with purang-apin and pagli-rahnam as the symbol of leegang fraternity being hosted with traditional recipe and community’s buffeting custom. Besides performance of leegang rituals, the other attraction of the day was the idyllic organization of sports and extempore drawing competitions for the children and games for the women. Winners were presented with prizes. A general body meeting was held as a part of Ali-Aye-Leegang celebration where cultural shows were presented by the local artists. Ghanshyam Pegu, Manoj Kumar Doley, Debananda Narah, Anima Doley, Debajyoti Doley and Tapan Kouli spoke on the occasion. 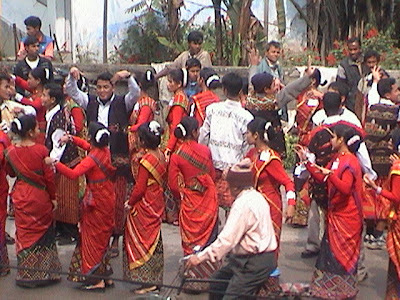 In the cultural functions, varieties of Mishing dances were presented by Anubha Pegu, Binita Doley, Baby Doley, Sapna Kouli, Sheila Doley and Nabanita Doley and also by the child artists Chynttia Doley, Bhavana Pegu, Pooja Kouli. The soulful oi-nihtoms were sung by Dharani Misong, Debananda Narah and Shri Pangging. Meeting ended with vote of thanks proposed by the General Secretary Mr. Migam Doley. Pre-Leegang encounters on the evening of 7th March were more entertaining. Peter Pegu took more than a dozen children to an entertaining square in a specially arranged hall of the resort and delighted them in presence of their parents with skits, songs, games, quizzes and other fun and fair. After the children’s amusements programme, there were non-stop sequential drum beats where one can take his steps for free-style dance or join in the group rhythm with gumrag beat, without hesitations. The resort authority served the gathering with a sumptuous dinner and tasty drinks however with limited quantity. To commemorate the occasion, a souvenir styled as “Asinang Onam” was also brought out. The salient features of the souvenir are its Kids’-Pages where twenty children contributed their budding talents into this section with creative art-works, poems and short stories. Amongst them, story by Nijora Doley, poems by Yein sisters, Mausoomi and Mayuri, drawings by Chynttia Doley, Aman Pait, Dhruvajyoti Kouli, and Bhavana Pegu are remarkable.